LEGOs are cool. Did you see the announcement for the Academy Award nominees this year done in LEGOs? Very, very clever, something I have been working on (creating movie scenes with LEGO bricks). It is a wonderfully expressive medium. All you have to do is look at the brilliant work of Nathan Sawaya to see that a creative person, someone who opens themselves to creative possibilities, does not fear working in any medium. I heard Sawaya speak at Comic-Con 2010 (yes, home of comic books, that other debased medium) and he gave one of the best talks I have ever heard about creativity. Using LEGOs to express Big Ideas is really thinking outside the box rather than in the same staid old ways that most museums do. That said, here is a project my son and I just entered into the LEGO Harry Potter Building Challenge. This rendition of Professor Sprout’s greenhouse and the magical plants of Hogwarts School of Witchcraft and Wizardry is our imaginative creation designed to express the beauty of working with your hands, the cross-cultural fascination with models and miniatures, the crossroads where the natural and the mechanical meet, and the breaking down of barriers between child’s play and adult excursions into playful realms. 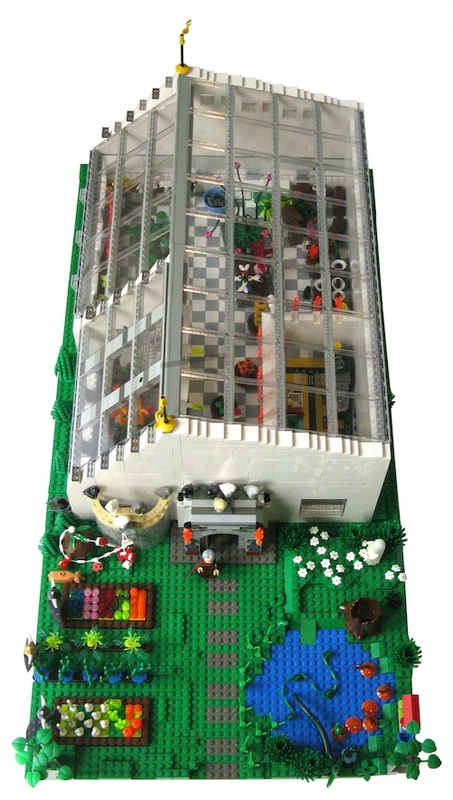 And all those good, heady ideas in the form of LEGOs!